When healthcare organizations hatch plans to adopt electronic records, HIM staff become key agents for change. Google the phrase “EHR failure rate” and you’ll find some disturbing numbers that may have healthcare organizations second-guessing their quest for federal stimulus dollars. Hospitals that have experienced less-than-successful transitions from paper to electronic records have reported problems ranging from downtime and disrupted workflow to huge backlogs in HIM and physicians boycotting cumbersome systems because they could not find patients and records in the system. In addition to those shortcomings, there have been reports of lost revenue and data-integrity lapses that could lead to medical errors. 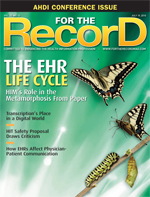 While the transition to an EHR is a monumental task, it need not be a nightmare. In fact, timely planning, best-practice research among peers, and multidisciplinary leadership during the transition can even bring a hospital community closer together. To gain insights on how this process works best, For The Record collected the thoughts of four HIM professionals with firsthand experience: Danielle Berthelot, RHIA, director of HIM and cancer registry at Woman’s Hospital in Baton Rouge, La. ; Rita Bowen, RHIA, AHIMA board president and enterprise HIM director for Erlanger Health Systems in Chattanooga, Tenn.; Kristy Courville, director of HIM at Lafayette General Medical Center in Lafayette, La. ; and Jada Songy, MBA, RHIA, director of HIM at Terrebonne General Medical Center (TGMC) in Houma, La. The consensus is that an interdisciplinary steering team should be formed at least 24 months prior to the scheduled go-live. Depending on the hospital, the committee should include representation from executive management, the governing board, administration, physicians, nursing, department leadership, and HIM. To ensure that forms can be scanned into the EHR efficiently and accurately, it’s critical to prepare them ahead of time. For 18 months prior to go-live of its EHR imaging system, Erlanger gathered all its forms and had them inventoried, redesigned, and bar coded. Not having bar-coded forms means performing manual indexing, which is time consuming and can be a source of errors, notes Berthelot. Songy also recommends conducting a master patient index cleanup approximately 24 months prior to go-live to obtain the most accurate and clean demographic information on all patients. Lafayette General held training sessions at various times throughout the day and night, as well as “skills fairs” to encourage staff and physicians to play with the system. In addition, highly trained superusers were assigned to go anywhere, anytime to train physicians and all staff members. Older records that remain on paper or microfilm should be easily accessible, not stored off site where it takes days to retrieve them when a patient returns to the hospital. Songy recommends increasing the number of PCs and dictation equipment available on all units. “It’s important to have computers next to dictation phones because physicians want to view records and dictate at the same time,” she says. She also cautions not to expect physicians who consult with the hospital only once or twice per year to remember how to log in and maneuver through the screens. TGMC has set up workstations in the HIM department where a team of staff members is available to assist physicians at any time. The hospital also brought in three temporary full-time employees before go-live and retained them for one month after go-live to help keep pace with paper processes. During the transition, Lafayette General noticed a temporary increase in its discharge not final billed, largely due to the learning curve for physicians, coders, and staff using the scanners. While IT expertise is indispensable in building and supporting an EHR, HIM should be prepared to lead and manage the initiative. At Woman’s Hospital, the information systems department fulfilled a support role while HIM worked directly with the vendor, which helped minimize misinterpretations. “HIM led the effort, but the support from information systems helped us to achieve our goals,” says Berthelot.